The Ottawa Humane Society is reminding pet owners that the holidays present many hazards for pets. 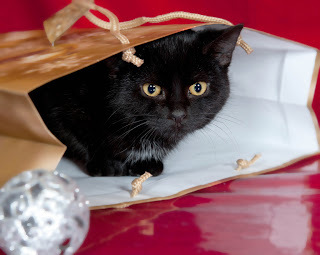 The same things that make Christmas special to people may cause problems for their animals. Here are the OHS's Twelve Pet Tips for Christmas to keep your companion animals safe, healthy and happy. 1. Holidays are a busy time for visiting and being visited – you may be away for extended periods or have a house full of guests. If you're away, have someone check in on your pet or board your pet. Note that your pet's vaccinations will have to be up-to-date to be accepted at a boarding facility. 2. If you're entertaining, you may wish to keep your pets in a quiet room away from the noise and activity. If they're mingling among the guests, make sure you're monitoring them so that they don't share your guests' holiday finger foods! 3. Christmas ornaments should be "pet-friendly." Avoid using tinsel on trees! Curious animals are attracted by the shiny strings and may swallow them, which can lead to serious injury-and expensive surgery! Ornaments hung on lower tree limbs should not be breakable. Also, keep your tree free of decorations made of food! 4. Barricade the water trough around the tree to prevent your pet from drinking the water, which may be dirty and contain pine needles, which are indigestible. 5. Be careful with Christmas lights! Secure electrical cords and conceal outlets. Pets may chew on cords; and keep pets away from open flames. 6. Some Christmas plants are toxic to pets. Keep your pets away from mistletoe, holly, poinsettias and amaryllis. If ingested, they may cause vomiting, diarrhea and/or other problems. If your pet has ingested something you're unsure about, call your veterinarian! 7. After gifts have been unwrapped, discard or store wrapping paper and ribbons, which could be dangerous, play toys for pets. 8. You're not the only one looking under the tree with curiosity. If you don't know what's in a package, don't leave it under the tree! You may find out the hard way that Aunt Jane got you a delicious box of Belgian truffles. Note that chocolate is toxic for cats and dogs. 9. Table scraps and left-overs aren't just too rich for your pets. Bones in the meat could lead to serious complications or death. 10. Ensure that edibles in Christmas stockings or on the tree are unreachable by your pet and away from dangerous places, such as the fireplace. 11. Always ensure that your pet is wearing adequate identification. With more frequent comings-and-goings, it's easy for your pet to slip out of the house unnoticed. 12. On colder days, limit your pet's exposure to the out-of-doors to short time periods.